A current National Gallery free exhibition is of Dutch still life painting. I visited some weeks ago, only to discover that I was a day early. So, with an hour or so set aside before meeting friends I decided to follow in the footsteps of Celia and Roz, the heroines of my short story ‘A Changing Sky‘ as they wander around the Gallery. 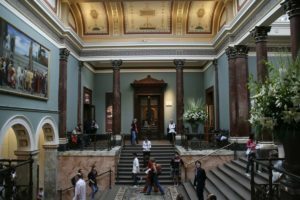 The two young women, friends since childhood, have been separated since each married and they meet in the Gallery as a reunion. Both are disappointed with their lot, one is at a crisis point. Yet at first both pretend all is well. It is through viewing and discussing the paintings that they gradually reveal their true state to each other. The story was written some years ago. 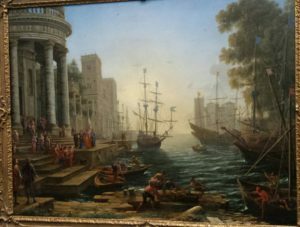 The first painting in the story is ‘Seaport with the Embarkation of St Ursula‘ by Claude Lorraine. Celia views it alone, before Roz’s late arrival, admiring is classical coolness. St Ursula is the virgin saint, patron of maidens and Celia thinks of her own youth, which both she and Roz remember as a sort of Arcadian life. The painting is hung in Room 20, not in the semi-octagonal room of Claudes and Turners where it hangs in the story. 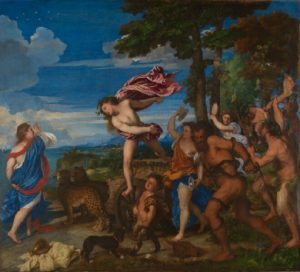 The first painting seen by both women in the tale is Titian’s ‘Bacchus and Ariadne‘, which hangs in Room 2, near the entrance. This is an exotic scene full of motion and lambent violence, the snake-wreathed satyr, the Bacchantes, the thigh-bone wielding worshipper with his phallic asp. I love the leopards. But it is too ‘hot’ for Roz who wants calm. She has ‘escaped’ from a manic, if good and decent, husband. So they proceed to the Dutch rooms. So did I, but here I was stumped, for the usual order of paintings had been disturbed by the removal of those still life canvasses which were to be part of the exhibition. The Vermeers are too famous to tuck away so I found the ‘Young Woman standing at a Virginal‘ easily. 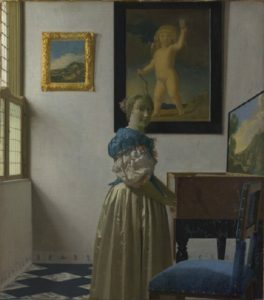 I enjoyed its pearly colours and soothing order, but was aghast to discover that the Pieter de Hooch painting seen next by my heroines had gone missing. In vain, I asked attendants, but none seemed to know the painting let alone its location. Then I came upon a gentleman who not only knew the painting but offered to take me to it. Upon arrival we were both confounded as the painting wasn’t there ( I subsequently found it wasn’t currently on display ). My search for quiet domesticity was foiled. Could I be entering my own story? This was all getting very Borgesian. Pieter von Hoogestraten’s perspective box was still there. 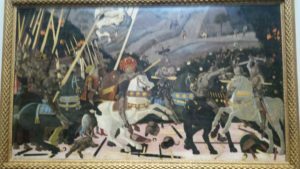 A small queue was waiting to look through its peephole, so I took myself off to the Sainsbury’s Wing and Uccello’s ‘Battle of San Romano‘. This is such a popular painting, even though damaged, because, I think, of two things – the highly patterned nature of the scene as it now stands and its horses. These remind me of those highly decorated, big-eyed, wooden horses on carousels, rising upwards and forwards, then down and back, on their glossy poles as the world swings sedately by. I digressed here, to a painting which I almost included in the story – ‘Venus and Mars’ by Botticelli. It was a possible metaphor for the battling within a marriage, but I decided that the ‘Battle’ was better, both more obvious and more oblique. Besides, the very languidness of the Botticelli made it unsuitable for my tale’s purpose. Celia is at war with herself ( and sometimes her husband ) but the two Gods look much too content and satiated in each other’s company for it to work in my tale ( though Venus looks a little peeved, I wonder why ). The final specific painting in my story, as opposed to an unnumbered succession of religious altarpieces, is the painting formerly known as ‘The Arnolfini Marriage‘ by Jan van Eyck. This, I think, is worthy of an article all of its own. A painting rich in symbolism, it was attributed wrongly as a marriage picture, which distorted the way in which it was seen. Thus it is, in a way, an opposite of van Hoogestraten’s box, or Holbein’s ‘Ambassadors‘ which were painted out of perspective so as to give perfect perspective from one single viewpoint only. But that’s another story. Here my protagonists left the Gallery and I found that I would have to do the same, as it was about to close. I retraced my steps back into the original building so as to catch two new paintings in the Impressionist rooms ( the 40s Rooms ). These are usually the most popular rooms, their contents both beautiful and easily accessible, but, fifteen minutes before closing time, I had them mostly to myself. So I sat quietly, looking two Monets which I had not seen before. Bliss. 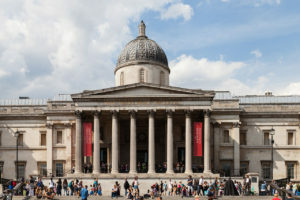 This entry was posted in Art, Culture Vulture, London, Writing and tagged London, Worth a visit, Writing & publishing by juliej. Bookmark the permalink.